Chef Marc Vidal - Recipes - Find. Eat. Drink. Recipe for Almejas con Ajo y Perejil (Clams With Salsa Verde) from Marc Vidal, Executive Chef of Boqueria in New York. 1) In a pot or bowl put 12 qts of clams, 1 cup of salt and enough ice water to cover the clams. 2) Let soak for 30 minutes stirring occasionally, strain and portion into approximately 12 clams. 1) Heat pan on high on hot stove. 2) Mix portioned clams with olive oil and put in pan. 3) Cover and cook until open. 1) Cube bread and fry at 375 degrees F until golden brown. 4) Take parsley, oil, garlic and bread and blend in Vitaprep until thin. 1) Put clams in metal bowl and drizzle with Ajo y Perejil Sauce. 2) Plate open side up and pour sauce over top. 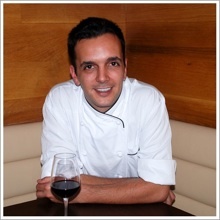 Executive chef of Boqueria in New York. Marc is bringing authentic cuisine from his native Spain to New York City. Marc Vidal’s recommendations for where to eat, drink and shop in New York, Brooklyn, Miami, Barcelona, and Thailand.